Springreen No. 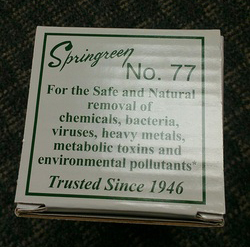 77 is used both externally and internally for the safe and natural removal of toxins created by chemicals, bacteria, viruses, heavy metals, metabolic toxins and environmental pollutants. Questions? Call Dr. Khristi Otto today (920) 915-8011.